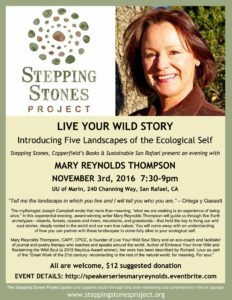 In this experiential evening, award-winning writer Mary Reynolds Thompson will guide us through five Earth archetypes—deserts, forests, oceans and rivers, mountains, and grasslands––that hold the key to living our wild soul stories, deeply rooted in the world and our own true nature. You will come away with an understanding of how you can partner with these landscapes to come fully alive to your ecological self. This Bay Area Speaker Series community event is a benefit for the Stepping Stones Project, a non-profit, serving youth and their families around the Bay Area through long term mentoring and contemporary rites of passage. All ticket purchases and additional donations are 100% tax deductible.